In 2009 we presented the idea of using collaborative filtering within a complex software application to help users learn new and relevant commands (Matejka et al. 2009). This project continued to evolve and we explored the design space of a contextual software command recommender system and completed a four-week user study (Li et al. 2011). We then expanded the scope of our project by implementing CommunityCommands, a fully functional and deployable recommender system. CommunityCommands was made available as a publically available plug-in download for Autodesk‟s flagship software application AutoCAD. 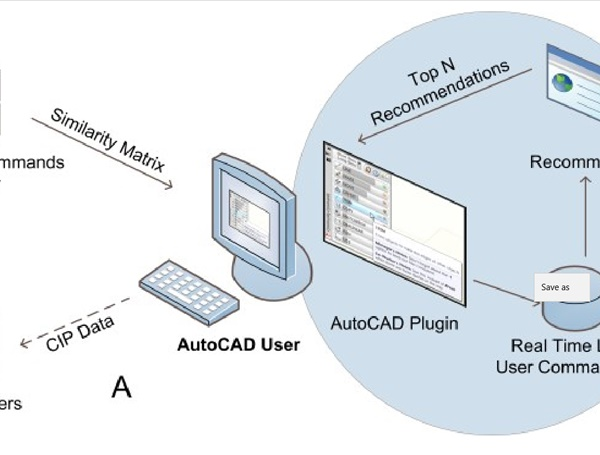 During a one-year period, the recommender system was used by more than 1100 AutoCAD users. In this paper, we present our system usage data and payoff. We also provide an in-depth discussion of the challenges and design issues associated with developing and deploying the front end AutoCAD plug-in and its back end system. This includes a detailed description of the issues surrounding cold start and privacy. We also discuss how our practical system architecture was designed to leverage Autodesk‟s existing Customer Involvement Program (CIP) data to deliver in-product contextual recommendations to end-users. Our work sets important groundwork for the future development of recommender systems within the domain of end-user software learning assistance.